Why hello there Lone Gamers readers! My name is Counterbob (obviously not my real name) . I’m going to be a new contributor here on Lone Gamers. What do I have to offer you may ask? Well I am an avid Magic the Gathering player and I have a YouTube channel all about it. If you care to check it out its www.youtube.com/counterbob8. I’ll occasionally do game reviews and even table top game reviews but for the most part my content will be MTG based. As this is my first article I’ll give you a little bit about myself. I’m 28 years old and I live in the great state of New Jersey. I’ve been playing Magic the Gathering for about 10 years now. I’ve only be getting into actual competitive magic the last 4 years on and off. I wish I could dedicate more time to it. About 2 years ago I started my MTG YouTube. It’s been going fairly well. I really enjoy editing and being creative and putting that to getting with magic it’s been fun. There are times when I get a little too busy in life and don’t put a video out for a while but hey it happens. I mostly play standard and that’s what most of my articles will be on. I did have some Legacy cards but I recently started picking up modern cards as I feel like it’s going to be played a lot more then legacy. OK now let’s get to some cards! M14 just came out and honestly I’m not to excited about it. Core sets are never all that exciting to beginning with but this one just feels so meh. Last year we had Thragtusk and other just solid cards. Before that we had titans. This year it just feels like such a letdown. There are a few cards that I like from the set but there’s nothing that really gets me jumping for joy. The 2 cards that I actually really like are Scavenging Ooze and Young Pyromancer. Scavenging Ooze it’s a solid card for the standard environment right now. With a bunch of Reanimater decks out there it certainly helps. It’s even excellent against the aristocrats deck. You can remove the undying cards from the graveyard with the trigger on the stack. Also being a decent sized body after a few activations can put a clock on some people. The decks that can use Ooze are basically any deck running green at the moment weather it’s in the main or in the side be sure to start picking them up when you can. I think Jund will most likely benefit the most from this card. I love the card Talrand the Sky Summoner. I played a u/g delver deck with a few copies of him in it last year. That was back before Ravinica came out. I recently have been playing a BUG with a single copy of Talrand in it and he is always awesome if you get a chance to untap with him. Why do I bring that up? Well Young Pyromancer is a cheaper non legendary version of Talrand. Right now there is no deck where he fits right in but I could see a u/r delver deck sprout up. 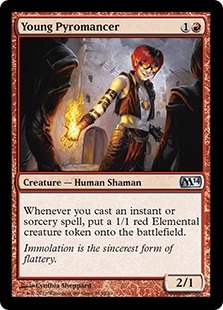 Maybe even Grixis or RUG. Playing cards like Think Twice and getting to draw a card along with putting a 1/1 out is amazing. This kind of card works perfectly with delver and Runechanter’s Pike. All 3 want a lot of Instants and Sorceries in your deck and as we’ve seen in the past delver can do a lot of damage. If you like tempo style decks like myself, I recommend picking them up before they become a 3 dollar uncommon as they will mostly likely see play in legacy and modern. That’s it for this week. I want to be putting out an article out a week but next week I’m going on vacation with my wife so I won’t be around. The week after I’ll have a report on the Starcity Games Invitational in Somerset that is happening this weekend. As I get a better schedule of writing I’ll narrow down a day so you guys can look forward to more content. If there is any MTG related questions you want me to answer or anything you want me to go over let me know.